What did Luke Wilson say in "Anchorman: The Legend Of Ron Burgundy" after the bear tragically ripped off his other arm? Ah yes. That's it. "It's getting to be ri-goddamn-diculous." Sing it, sister! First, there was Hilary Duff taking the inimitable role of Bonnie Parker as played by Faye Dunaway in "Bonnie and Clyde" - one of my all time favorite films and whose poster I can see if I simply turn my head to the left as I type these words. Disaster seemed to be averted when Hilary Duff was paid a cool $100,000 to walk away from the oft-delayed project. Disaster re-convened when Lindsay Pulsipher was given the inimitable role of Bonnie Parker instead. Things unbelievably worsened when Neil Burger decided to take his own crack at the story of Bonnie and Clyde, and in the very post deriding that announcement on this site the obligatory photo of Faye as Bonnie was accompanied by the following wisecrack: "Maybe in this version they can get Miley Cyrus to 're-imagine' the role of Bonnie Parker?" The movie gods, it seems, heard my words and chose to punish me. Miley Cyrus is in talks to star as one Bonnie Parker for a Lifetime-made story of Bonnie and Clyde. I mean, really? It's not enough that Miley Cyrus was allowed onstage at the 2010 Oscars in lieu of her majesty Lauren Bacall, now she has to play Bonnie Parker too? And thus, as ever, the inevitable "From Here To Eternity" remake starring Jessica Simpson draws one step closer. 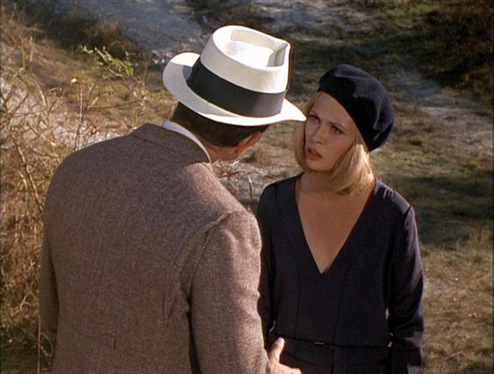 Warren Beatty just told Faye Dunaway the news. She doesn't look pleased.